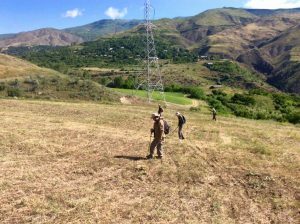 The Vayots Dzor region, home to the important Chalcolithic site of Areni-1, has seen an increase in research in recent years by a growing scholarly community. The VDFLP aims to understand the rise and fall of fortress culture along the river valleys and roads of this region through a variety of archaeological and historical investigations. In 2018, we were joined by a team from the University of Pennsylvania, which completed extensive and intensive survey in the Yegheghis river valley. The team, led by Dr. Peter J. Cobb, employed a variety of novel digital recording methods (read more here). Meanwhile, a group of researchers from the University of Central Florida excavated soundings at Karglukh II, a cyclopean fortress site located south of the Selim pass. The excavations revealed a significant medieval re-occupation at the site, and we anticipate that future seasons’ research will clarify the full occupational sequence. 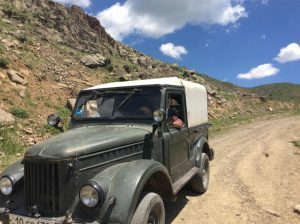 In 2017, we focused our efforts upon investigating a north-south corridor in southern Armenia that follows the Yegheghis River north to the Selim pass. We paired extensive survey with intensive survey to elucidate large sites along with smaller-scale features. In this first survey season, we documented more than 30 sites using drone-based photogrammetry along with other digital documentation methods. Follow us on Facebook to get “live-from-the-field” updates. To volunteer for a future field season, fill out this form to get on the mailing list for an upcoming info session.